The Mid-Year Economic Analysis of the finance ministry, prepared by chief economic adviser Arvind Subramanian, is controversial. It asks whether India should depart from its promised path of fiscal consolidation, which calls for the fiscal deficit to fall by another 0.4 per cent of GDP (from 3.9 per cent to 3.5 per cent) in 2016-17. The analysis sees fiscal strains ahead. Higher wages and pensions mandated by the Pay Commission will swallow up 0.65 per cent of GDP next year. But public investment needs to rise, to fill the breach created by falling private investment by highly leveraged corporations. Such rising public investment is desirable, says the analysis, since it will crowd in rather than crowd out private investment. Finally, says the analysis, the GDP deflator has turned negative, so nominal GDP growth is well below real GDP growth. Nominal gross value added is up barely 5.2 per cent against real GDP growth of 7.4 per cent. Deflation worsens the balance sheets of the government and leveraged corporations, squeezing investible surpluses. 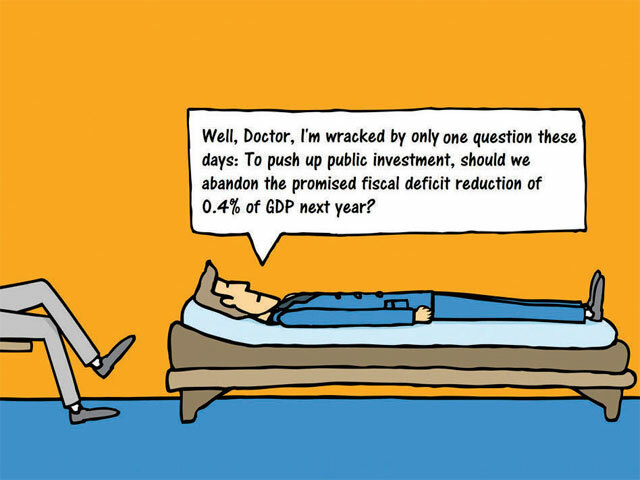 So, the analysis asks, to push up public investment, should we abandon the promised fiscal deficit reduction of 0.4 per cent of GDP next year? Absolutely not. The finance minister has made a solemn commitment, and his credibility is at stake. Losing that credibility is bad policy. Indeed, reduced credibility can hit the cost and volume of private investment far more than any ‘crowding in’ of investment that the analysis touts. Besides, many better ways exist to raise additional sums for public investment. The government must use these, and stick to its promised path of fiscal deficit reduction. Only a major crisis would warrant a diversion from this path, and none is in sight. The simplest and most obvious way of raising additional funds for public investment is to liquidate the government holdings of equities held in Specified Undertaking of the Unit Trust of India (SUUTI). These equities comprise highly liquid and attractive bulk holdings of blue chips, such as an 11.66 per cent stake in Axis Bank, 11.77 per cent in ITC and 8.18 per cent in L&T. These alone could fetch enough money to reduce the fiscal target by 0.4 per cent of GDP, releasing an equivalent sum for public investment. Why fund additional public investment by debt when the SUUTI route is available? The political buzz is that the government has succumbed to lobbying by ITC’s Indian managers, who fear that a big stake sale will lead to majority foreign ownership, and loss of Indian control. I find it incredible that the ownership of a tobacco company, which the government taxes heavily as a killer, should carry a higher priority than meeting promised fiscal targets. Again, the government has dithered for years about selling its remaining holdings in Bharat Aluminium Co (Balco) and Hindustan Zinc to the Vedanta group. Whatever the legal issues, surely the government can sort these out and finish the sale, which could fetch up to Rs 20,000 crore. Minister of state for finance Jayant Sinha says plans are afoot to sell a majority holding in some low priority public sector undertakings. But pious intentions on this score have not translated into action. Arun Jaitley should just do it. The price of Brent crude has fallen to just $36 a barrel. We cannot be sure that this will continue next year. But most experts believe the commodity super-cycle has ended, so commodity prices will remain low for several years to come. If so, India will get a continuing bonanza from cheap oil. The finance ministry should mop up at least half the bonanza, and pass on no more than half to consumers. That will be a painless way of raising investment funds, and will have all the virtuous characteristics of a carbon tax, which India can boast about in climate-change circles. Even better would be a bold move to decontrol kerosene, and replace subsidies with free solar lamps for beneficiaries in non-electric areas. In any event, cheaper oil and natural gas means lower subsidies for kerosene, cooking gas, urea and even electricity. The analysis warns of deflation creating problems for debt servicing, but needs to remember that same deflation — driven mainly by oil — reduces expenditures too, apart from providing a fiscal windfall. Finally, enormous sums can be borrowed by government corporations. So why load the borrowing burden on the Budget? The Railway Finance Corporation can borrow all the money needed for railway capex. Powergrid, Power Finance Corporation and the Rural Electrification Corporation can borrow all the sums needed for the coming big push in power transmission. MTNL and BSNL can borrow for expanding the broadband network to meet Digital India targets. The list goes on and on. Purists will point out that borrowing through public sector companies rather than the Budget makes no difference to the public sector borrowing requirement (PSBR), which some economists will say is the most relevant parameter to target. Very true. But the Fiscal Responsibility and Budget Management (FRBM) Act deliberately avoided such purism. By targeting the fiscal deficit rather than the PSBR, the Act gave the finance minister some flexibility in meeting his targets. He should use it.